County and tribal health departments around Montana carry out an amazing range of activities to protect and improve the health of our communities. Much of this work happens quietly behind the scenes, and many people are less familiar with the role of health departments than with the role that hospitals and clinics play in improving community health. Living with a chronic illness such as asthma, arthritis, or diabetes presents many challenges, from keeping up with medications and recommended medical tests, to following recommendations for exercise, diet, and other treatments. 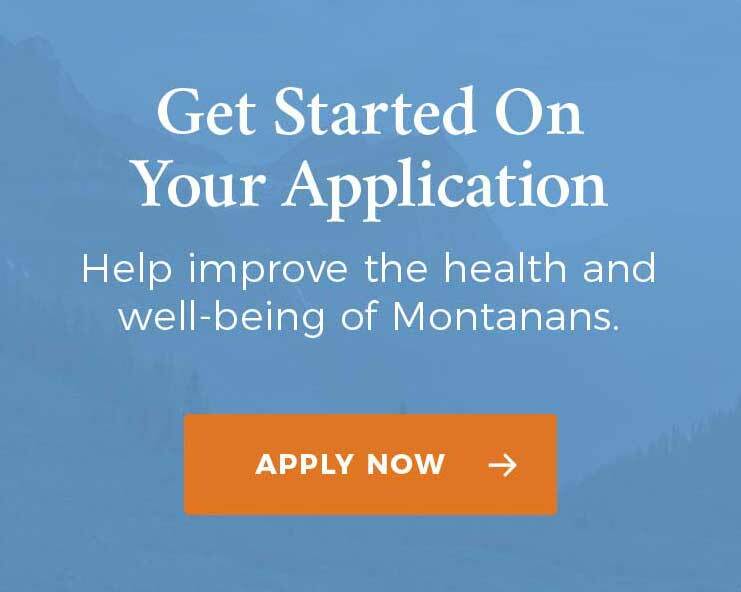 Funding from MHCF will help establish the Chronic Disease Self-Management Program in Butte-Silver Bow. This program was developed by Stanford University to help individuals with chronic conditions learn how to manage and improve their own health while reducing healthcare costs. Those suffering from chronic conditions such as allergy/asthma, arthritis, cancer, diabetes, epilepsy, heart disease, obesity/overweight, and the aftermath of stroke are eligible for the program. The Chronic Disease Self-Management Program focuses on problems that are common to people suffering from any chronic condition such as pain management, nutrition, exercise, medication use, emotions, and how to communicate effectively with doctors and other providers. Workshops will be offered at the county health department and other community venues will be attended by 15 to 20 participants over a six week period and will be led by trained facilitators who manage their own chronic health conditions. Facilitators will focus on building skills needed to manage chronic conditions by sharing experiences and providing mutual support while facilitating action planning, interactive learning, behavior modeling, problem-solving, decision-making, strategies for coping, and social support for change. Published studies have shown that the Chronic Disease Self-Management Program results in significant and measurable improvements in the health and quality of life of people with chronic conditions. These studies also show that the program results in cost savings – fewer emergency room visits, inpatient stays and outpatient visits (estimated savings of $100 per participant), and fewer hospitalizations (estimated savings of $490 per participant). Health benefits include improvement in areas such as fatigue, shortness of breath, pain, social activity limitation, illness intrusiveness, depression, and health distress; and improvement in health behaviors such as exercise, cognitive symptom management, communication with physicians, and self-efficacy. In 2008, the Missoula City-County Health Department (MC-CHD) launched a third-grade body mass index surveillance program. Data collected from local third-graders showed that the county’s childhood obesity rates had not escaped the national trends. Obesity rates had increased from 7 percent in 1980 to 13 percent in 2008. Childhood obesity puts kids at risk for many health issues — cardiovascular disease, type 2 diabetes, respiratory ailments, depression, and lower self-esteem, as well as serious health risks that persist into adulthood. With funding from MHCF, MC-CHD is partnering with local schools to implement Take 10!, an evidence-based academic and physical activity curriculum in local schools. The goal of Take 10! is to increase physical activity in the classroom. This work will help lay the foundation for schools to align their physical activity policies with national recommendations, which call for 60 minutes of moderate-to-vigorous physical activity from the time kids leave home for school all the way through after-school programming. In addition, nutrition training will be offered through the CATCH (Coordinated Approach to Child Health) program to help schools develop competitive food policies. Competitive foods include anything sold in vending machines and the student store, as well as food provided for classroom celebrations, rewards, and fundraisers. This nutrition component of the work will help schools meet the Smart Snacks in School guidelines. The Lewis and Clark Public Health Department is dedicated to addressing chronic diseases like heart disease, cancer, diabetes, and cardiovascular disease through a comprehensive prevention plan. Funding received from MHCF will provide necessary resources to ensure a healthy workforce and a healthy community through the implementation of two primary prevention strategies: worksite wellness initiatives and community coalition development. Many employers are beginning to adopt programs that help improve employee health and wellness. Public health staff will work with employers to assess existing worksite wellness policies; draft, adopt, and implement evidence-based policies; and provide technical assistance to ensure employers use best practices when developing comprehensive wellness initiatives aimed at reducing and preventing chronic disease. Additionally, public health staff will continue to lead a group of local organizations that make up the Healthy Communities Coalition to address chronic disease by instituting strategies outlined in the county’s Community Health Improvement Plan. This community-wide investment and progress toward improving physical activity, nutrition, and air quality will make an important contribution to creating a healthy community. In 2013, Flathead County completed a Community Health Needs Assessment. The data showed that Montana has been at or near the top of the nation’s suicide rate lists for the past 30 years. During that time period, Flathead County had one of the higher suicide rates in the state. As a result, Flathead County Health Department chose to use funds from MHCF to address gaps in the provision of mental health care, with specific strategies aimed at reducing the rate of suicide in Flathead County. The Suicide Prevention and Intervention Project in Flathead County will focus on three main components. First, the health department will provide training for groups that are likely to encounter people in crisis, such as law enforcement, first responders, social service providers, and community members. Training will include the evidence-based approaches of QPR (Question, Persuade, and Refer), ASIST (Applied Suicide Intervention Skills Training), and Mental Health First Aid. Second, the health department will conduct a public awareness campaign aimed at reducing the stigma of suicide and promoting resources in the community for suicide prevention and intervention. The third and final focus will be providing survivor packets of information to families affected by suicide and offering gun locks to community members. The project expects to provide training to 200 people and distribute 300 gun locks annually. At times, patients with complex medical conditions and other challenges such as co-occurring mental illness or addiction may end up being seen more often in the emergency room or hospital than in an outpatient setting. Such a pattern of care can be costly and may not achieve the best outcomes possible. In response to the Yellowstone City-County Health Department’s (RiverStone Health) community health needs assessment and objectives laid out in their community health improvement plan, Yellowstone County is seeking to collaboratively increase appropriate access to health services for “high-utilizing” patients. Their goal is to increase the number of residents who have access to a specific source for ongoing care and to decrease the number of residents who use the emergency department more than once per year. RiverStone Health, in partnership with Billings Clinic and St. Vincent Healthcare, will seek to identify common patients who frequently use the three healthcare facilities. Through this discovery, a process for sharing data (that adheres to laws and patient protections) between organizations will be identified. Based on the findings, the health department and its health system partners will develop a specific plan to better address the needs of the specific patients identified, as well as a protocol and model for future implementation that will be created in collaboration with community partners participating in the existing Healthy by Design Coalition.